It’s taken a long time to come to the point of realizing that we don’t really need quite so many single use plastic shopping bags. Now, Yukon is moving towards charging a fee for them. I think this is better than absolute elimination because I see that sometimes they are needed. It isn’t always expedient to use your own bag, say when travelling etc. Sometimes the store bags are needed. They can be re-used as a bag or I save them as clean packing material (could be reused at the destination). But many shoppers have replaced the need for that plastic film with cloth or more permanent bags, baskets, boxes, and quite refreshingly – no container at all. No container at all is quite the bold move. I see it with knapsack culture and I am also seeing people use the grocery cart as the container right to the car where some other system takes over. Ingenious. How did we take on the idea that we should use a plastic garbage bag for garbage? Landfills are teeming with plastic bags and most of them are the bags that aren’t really the garbage. Because awareness has evolved about plastic in the environment, I’m asking myself how to stop my contribution to this crazy outcome. Garbage bags are a Canadian invention. They came about in 1950, but were not sold for household use until the 1960s. That scheme took off. Of course, at that time, there wasn’t the same recycling or composting culture and so there were a lot of mixed materials and food waste in the bags. Another common use has been raking leaves into plastic bags. Here we have pure organics encapsulated in plastic. If they are destined for landfills, it is not good. When rotting organics (food, leaves, etc.) have no access to air, they undergo anaerobic decomposition. They release a number of compounds – one of which is methane gas. Methane gas is a major climate change contributor and is more problematic that carbon dioxide. Millions of garbage bags containing food wastes and other organic material like household plants, pet hair, meat, pet wastes, etc. are underground emitting this gas and other compounds. The methane is lighter than air and it seeps upwards. The reason that compost works for our gardens is that it typically involves aerobic decomposition. It has access to air and is often tilled or mixed up. More heat is generated and less methane is produced. There are active bacteria and organisms aiding the process. In addition to the bags trapping the organics and producing methane, there are the bags themselves. As we’ve discovered, plastic doesn’t really go away. It never quite entirely disintegrates in the same way that organics do. It breaks apart into smaller and smaller pieces, until those pieces are smaller than the eye can see. Here then, these pieces infiltrate water systems and animals. It’s pollution because it does not decompose. Studies are just beginning to look at this and the effects on our health. Since I am already sorting materials and composting, most household garbage is not organic or food waste. If I use a garbage container with a good lid, can I just put the loose waste into that? In other words, no bag? At present, garbage bags do have value for us. They help keep garbage pick-up manageable. They help to control odors. They make it easier for apartment dwellers to use garbage chutes. They prevent leaking. They’re good to contain industrial and hazardous materials. As with most techniques, there are upsides but let’s not dismiss the downsides. We need to keep finding better ways of doing things. Can we tackle this problem in a way that helps us retain the benefits while not ending up with a stupid amount of single use plastic in landfills or as pollution in the environment? Let’s start with some suggestive marketing of our own. Plastic bags are not garbage! Since I am already sorting materials and composting, most household garbage is not organic or food waste. If I use a garbage container with a good lid, can I just put the loose waste into that? In other words, no bag? Fast forward – I’ve found that I can! There is no scary mess after all. In getting to the TS, or for many other people, to the curb, I see the potential need for some kind of liner in the larger garbage pail. In a practical sense, the pick-up services likely cannot empty a full garbage can into the truck and let the loose materials fall in. I can see that would be cumbersome. It would take more time and like my own experience dumping into the TS compactor, loose wastes can blow around and out of the compactor/truck. So, what about a paper liner? Back to the autumn leaves – there are already sturdy and tall paper bags for that chore. Do they fit into my garbage pail? Why, yes they do! They can be folded at the top and voila – I’ve eliminated the plastic bag from my garbage path. Small and large plastic bags have their place and uses. Let them be intermediary containers. I can do that. I can adapt my use to keep messes at bay with them and then empty the bags into the appropriate larger specific use area. Bags full of cans into the recycling bin. Bags full of leaves, into a compost feeder pile or the TS organics area. 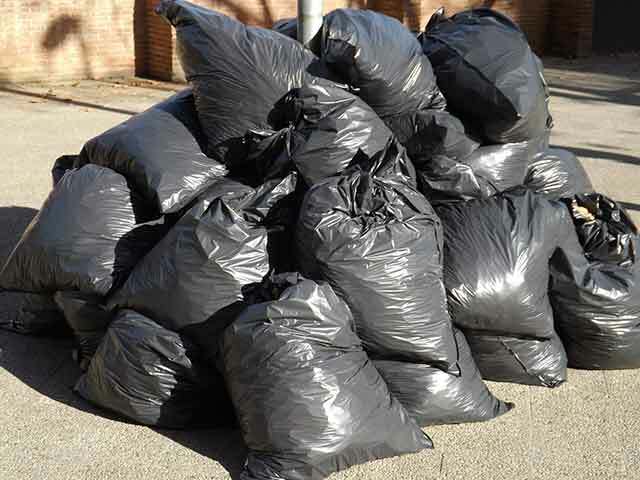 Bags with household garbage – emptied into paper-lined garbage cans. Can my bags handle a second use? If so, right on! I just diverted the need for another bag. If not, it’s destined for the soft plastic recycling bin. That plastic is recycled and remade into another product, diverting it from landfills and from breaking down in the environment. Victory: I’ve closed the loop on bags.